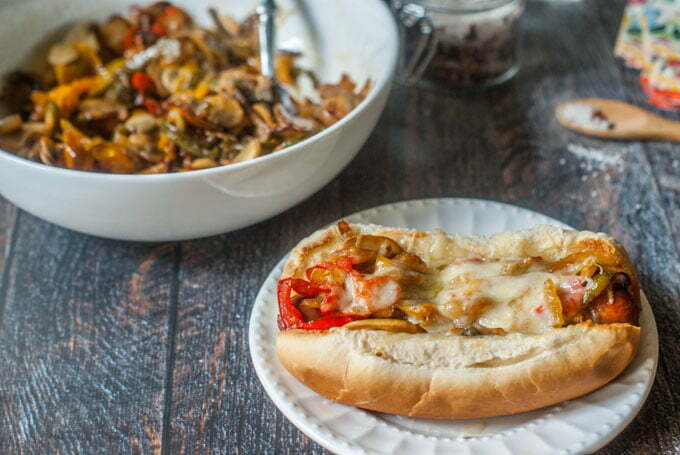 This Philly Mushroom Swiss Hot Dog is an easy and tasty way to dress up your dog. 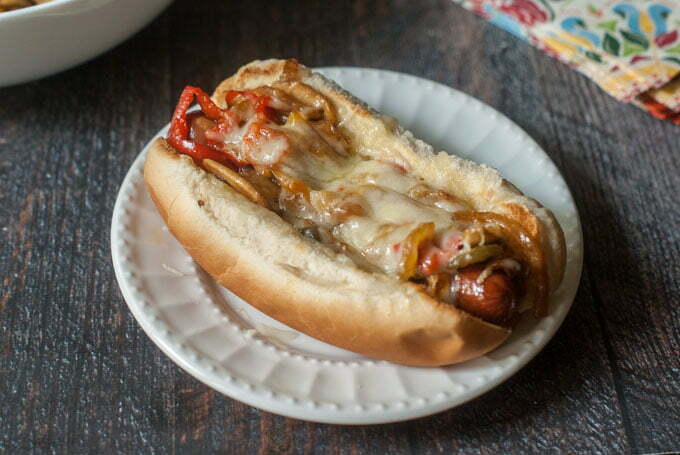 Onions, peppers, mushrooms and Swiss cheese make the perfect complement to a salty hot dog. And of course we have 2 low carb versions for you to try as well! Did you know it’s National Hot Dog month? 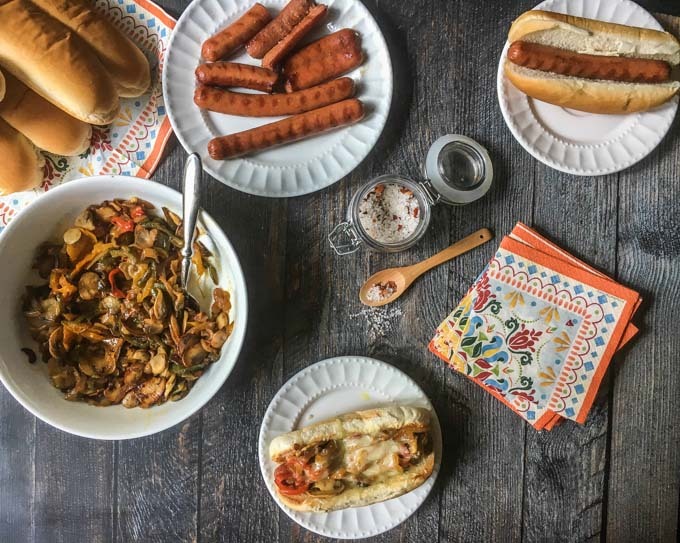 Well all of us at Sunday Supper know and today we are celebrating creative hot dog recipes. My contribution is this Philly Mushroom Swiss Hot Dog. It’s not very complicated but it is tasty. 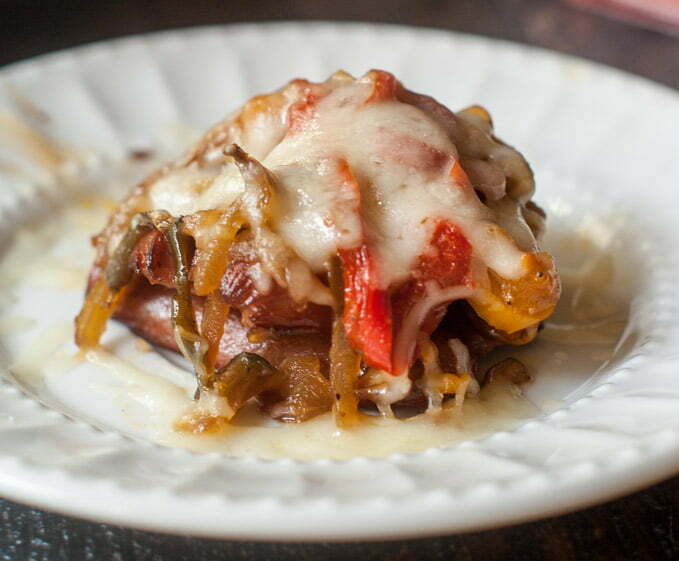 Loaded with sauteed onions, peppers and mushrooms and then topped with Swiss cheese. Even my father in law asked for seconds! And because I like to eat low carb foods, I also have 2 ways for you to eat this tasty dog without the bun. 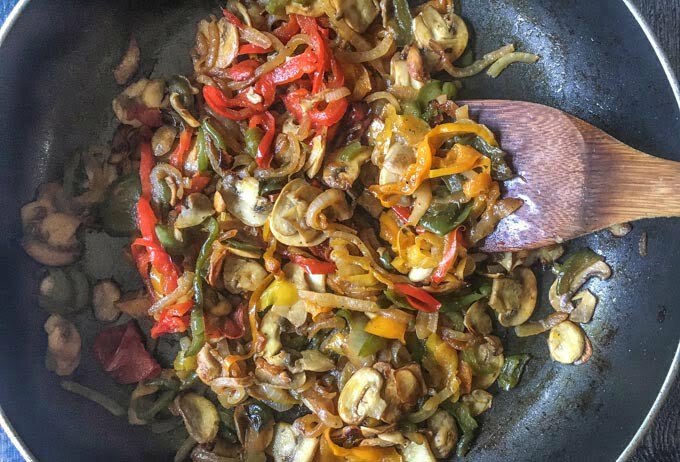 This most work you have to do for this recipe is sauté the onions, peppers and mushrooms. It takes a good 10 minutes to get it nice and brown. I love this trio of ingredients together. It’s great on hot sausage and flatbreads or used in soups and pastas. I had a bit leftover and I’m going to use it in a omelette tomorrow. 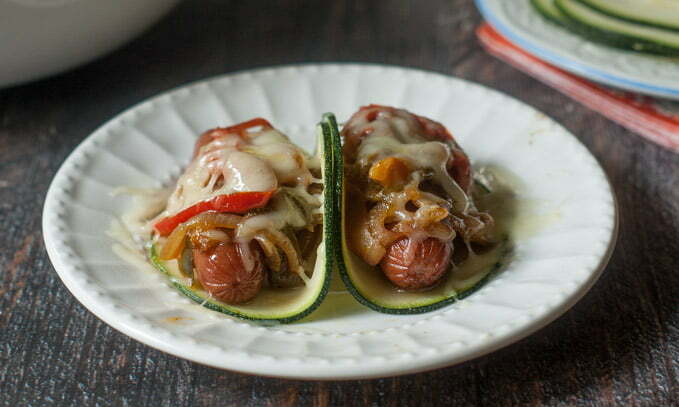 The basics of this recipe is to saute the vegetables and place on top of your hot dog and bun. Next add the Swiss cheese and place under the broiler until the cheese is melted. Now for the low carb versions I have two for you. The first is the zucchini taco. Since a have tons of zucchini from the garden, I took my biggest one and sliced it very thin. I used this to get the slices thin and uniform. And then used it as I would a bun. I had to cut the hotdog in half because my slices were not big enough. I loved this one personally. The other way was to take a hotdog, cut in half. Then take each half and slice lengthwise but not all the way through. Then flatten it out and cook or grill. That way you have a little square of hot dog. I did that for both halves and stacked them. This was tasty too but a little harder to eat. you definitely had to use a fork and knife. 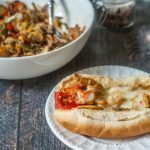 Well I hope you like my Philly Mushroom Swiss Hot Dog as well as the low carb versions. There are so many great recipes from my friends at Sunday Supper. Please scroll down and check them out. And thank you both Stacy from Food Lust People Love and Mary Ellen from Recipes Food and Cooking for hosting! Enjoy! In a large skillet heat up your oil and then add your vegetables. Saute until well cooked and starting to brown. In another skillet or on the grill, cook your hot dogs. Assemble you hot dog by adding the bun, topping with vegetables and then 2 tablespoons of shredded cheese. Heat under the broiler for a few minutes until cheese is melted. Thinly slice a large zucchini. 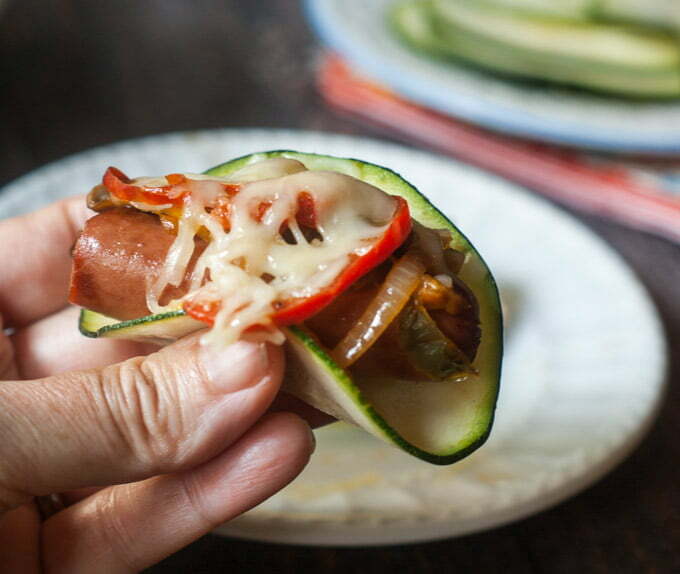 Cut hot dogs in a half and place in the zucchini like a taco. Top with vegetables and cheese and stick under the broiler until cheese is melted. For the stack, cut the hotdog in half lengthwise. Then take each half and cut down the middle lengthwise but do not cut through. Spread sides so it's flat and cook or grill. Take two hotdog pieces and stack on each other. Top with vegetables and cheese and stick under the broiler until the cheese is melted. I. Need. This. NOW. Totally obsessing over this beauty! Love Philly sandwiches so it stands to reason that I will love this dog as well. I love these toppings and the low carb options! I would love this on zucchini wraps! And I often eat mine without a bun! This just sounds divine! It was surprisingly good on the zucchini! Thanks …..I love anything with onions, peppers, mushrooms and cheese! Yes to everything about that zucchini bun!!! It worked out great Laura….I’ll be using those huge zucchini slices again. What entree isn’t better with mushrooms and cheese??? I love every thing about this Philly dog!! I love the Zucchini Wrap–GENIUS!! And can’t go wrong with these flavors!